Do you have frozen shoulder? If you have stiffness and in the neck, shoulder and upper back area accompanied by intense pain in the upper arm, radiating all the way down to the wrist, you may have Frozen Shoulder. This pain increases in intensity in cold weather, at night and when certain movements of the hand are performed. It also restricts the movement of the arm and you may not be able to keep your arm straight and lift it completely up above your head. If you have these symptoms, it is important to visit a doctor or orthopaedist to confirm the condition. 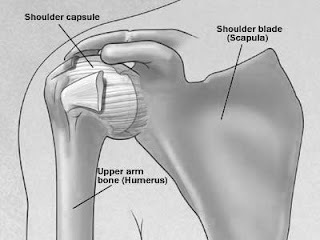 What are the causes of Frozen Shoulder? Frozen shoulder could be caused by many factors. A sudden spasm of the muscles around the shoulders, a sudden jerk or activity performed that can cause a spasm or damage to the muscles, faulty posture and lack of exercise. Diabetes is also closely related to frozen shoulder. That combined with reduced blood circulation in the area can cause increase in pain. Many people have been able to get rid of pain and the condition by modifying their lifestyle and including some exercises in their daily routine. Specific arm exercises, yoga asanas, physiotherapy, hot water fermentation, daily sun bath, specific arm massage and diet control (especially for Diabetics) has helped in maintaining and healing this condition. Many people have claimed to have been cured within a year by following such a routine. Gentle Swedish Massage by a trained therapist can greatly help in improving blood circulation, reducing muscle tension and spasms by treating specific trigger points and help in reducing pain and increasing range of movement of the hand. Aromatherapy in addition can boost the healing process. If regular massage sessions turn out to be an expensive affair, a family member can learn the techniques of Swedish massage to help out in the treatment of a loved one. The knowledge on alternative healing therapies never goes to waste and at least one member in each family should be aware of massage techniques as they can prove to be useful in many situations, including in knowing when not to massage. However, one must remember that faulty lifestyle and many other factors are causes of disease and so, massage alone cannot help solve the problem. Regular exercise and lifestyle modifications are a must for healing, not just Frozen Shoulder but any such disease.